While iOS 8.2 Beta 5 (12D5480a) Firmware and Xcode 6.2 Beta 5 (6C121) Software programs are still under beta testing development stage, Apple just released and seeded its yet another beta versions of iOS 8.3 Beta 1 (Build: 12F5027d) and Xcode 6.3 Beta 1 (Build: 6D520o) to iOS developers and non-developers (general users), before the final public released of iOS 8.2 and Xcode 6.2. The Direct Download Links of iOS 8.3 Beta .IPSW and Xcode 6.3 Beta .DMG Files for iPhone 6 Plus, iPhone 6, iPhone 5S, iPhone 5C, iPhone 5, iPhone 4S, iPod Touch 5G, iPad Air 2 6G, iPad Air 5G, iPad 4G, iPad Mini, iPad Mini 2, iPad Mini 3, iPad 3G, iPad 2G and Apple TV 3G are available below. According to iOS 8.3 Beta 1 (12F5027d) release notes, the latest update contains; Wireless CarPlay, New Emoji Picker, iCloud Photo Library Drops Beta Tag, Bugs Fixes for iCloud Drive and CloudKit, Support for Apple Pay for China Union Pay, Two-Factor Verification for Google Account Log-Ins and lots more you can read in below image! According to Xcode 6.3 Beta 1 (6D520o) release notes, the newest update holds; Swift programming language migrator from Swift v1.1 to Swift v1.2. Xcode 6.3 beta developer toolset also includes; iOS 8.3 beta SDK and OS X 10.10 SDK for Mac, iPhone, iPad and Apple Watch. An ease interoperability between Swift and Objective-C code. 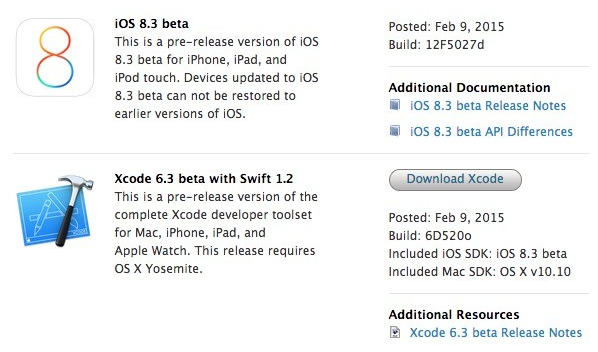 How to Install iOS 8.3 Beta and Xcode 6.3 Beta Updates? Apple iDevice users can get the iOS 8.3 Beta OTA Update (Over-the-Air) via Settings > General > Software Update option. If you're iOS developer, then go-to iOS Dev Center website for official iOS 8.3 Beta Downloads. If you're iOS non-developer (general public), then you can manually install and activate iOS 8.3 Beta without UDID developer account via iTunes for Free. Download Xcode 6.3 Beta DMG and iOS 8.3 Beta IPSW Files for iPad Air 2 6G, iPad Air 5G, iPad 4G, iPad Mini, iPad Mini 2, iPad Mini 3, iPad 3G, iPad 2G, iPhone 6 Plus, iPhone 6, iPhone 5S, iPhone 5C, iPhone 5, iPhone 4S, iPod Touch 5G and Apple TV 3G via Direct Links below. 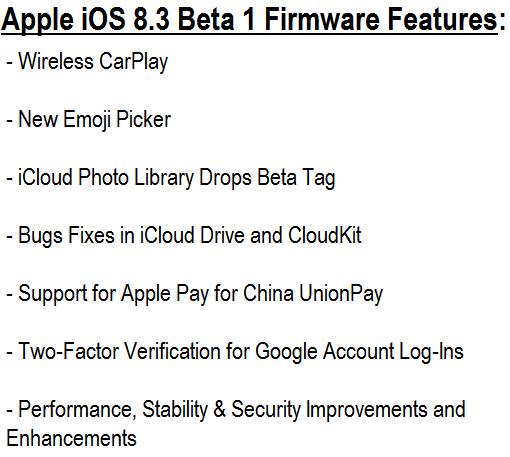 How to Jailbreak iOS 8.3 Beta Firmware? No Untethered iOS 8.3 Beta Jailbreak is available from PanGu, TaiG and 25-PP Jailbreak Tools. Note: The latest iOS 8.3 Firmware Beta 3 (Build: 12F5047f) Version is officially available by Apple. You can Download iOS 8.3 Beta 3 Update via Direct Links HERE.